As more information becomes available on the March 7 derailment of a Canadian National Railway oil train near Gogama, north of Sudbury, Ontario, it appears it is among CN’s worst oil train derailments (Sudbury Northern Life, CBC News 1, CBC News 2, Investor Central, Toronto Star). 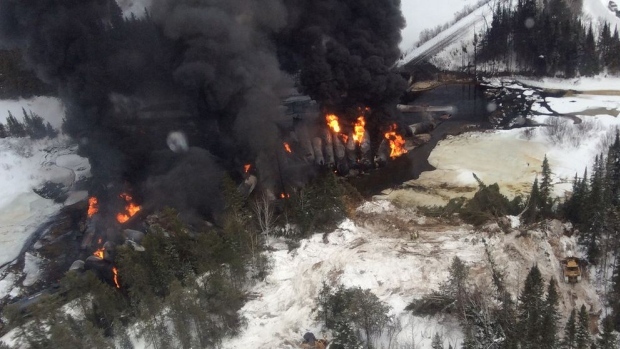 The number of tank cars loaded with crude oil that derailed about 3 km from Gogama has now risen to 38. A total of 94 tank cars was loaded with synthetic crude oil from Alberta’s tar sands region. At least 5 tank cars full of oil plunged into the Makami River which is part of the Mattagami River system. Investigators were unable to get close to the accident site due to the intensity of the massive fires that burned furiously, but it appears that firefighters have just put out the last of the fires which were essentially left to burn out. It is not clear whether air quality and drinking water advisories announced shortly following the derailment are still in effect. Track damage is so severe that a 460-metre temporary bypass around the wreckage site is under construction. The bridge across the river is seriously damaged, perhaps beyond repair. The derailment has cut off all rail traffic between Winnipeg and Toronto; CN’s mainline tracks remain closed for an undetermined period of time. Although it is too early to determine how much crude oil spilled, the environmental damage is bound to be significant. Oil has spilled into the Mattagami River system, including Minisinakwa Lake. Keith Stewart of Greenpeace Canada said, “Long after this initial spotlight fades away, we’ll still see impacts in the local ecosystems.” Some crude will end up in the soil, some in the water, and the crude that burned “will deposit toxins in the area which will eventually get into the ecosystem”, Stewart said. Particularly concerning is the fact that much of the spilled oil has made its way into the Mattagami River water system. 3 sets of booms have been placed in the river in an attempt to contain some of the spilled oil, but very little oil is ever recovered from spills, said Environmental Defence spokesperson Adam Scott. “Companies will talk about cleanups but, in reality, the cleanup is only of a small percentage of the oil spilled. In a case like this, it could be crude oil submerged into the river, into the soil. There is a good chance that there will be crude permanently in the environment in the region in some way”. There is no restoring the ecosystems to their original health he said. “So until something dramatic is done, we’re going to see this continuing over and over again”, Scott continued. Companies assure people that they have spill response plans in place, “but when your spill response plan is to let it burn for days, that’s kind of scary”, said Stewart. Nishnawbe Aski Nation Grand Chief Harvey Yesno has publicly called for a coordinated response from Canadian National Railway, the federal government and the Ontario government, following the second major CN train derailment, oil spill and fires near the Mattagami First Nation in 3 weeks that has threatened the community’s air and water quality. On February 14, another CN train loaded with crude oil from Alberta’s tar sands derailed in the Mattagami First Nation’s traditional territory, only about 37 km from the March 7 derailment site. That accident saw 29 of 100 tank cars loaded with crude oil fall off the tracks and 7 cars burned for almost a week. Over 1 million litres of crude oil was spilled, but the extent of environmental damage from that derailment has not yet been disclosed. The Mattagami First Nation is concerned about the impacts of the 2 spills and fires on the animals they hunt, fish and trap. Chief Walter Naveau of the Mattagami First Nation said his community no longer feels safe. “People in the community were feeling the effects of the toxins in the air – respiratory problems, they could feel it in their chests and their breathing.” He said he could not trust the public statements being made by CN which attempted to allay the concerns local residents had about air quality. He added his community is also concerned that the river flows into the community’s main spawning grounds for fish, in addition to habitat for other wildlife. Local Gogama residents are also concerned about the impacts of these latest CN derailments in their community. Dawn Simoneau, a life-long resident of Gogama, said her 2 daughters have been asking questions about the derailment, “Like ‘Are the fish going to be okay?’ and they are concerned as well”. Gerry Talbot, Secretary of the Local Services Board, said there is some question whether new federal rail safety regulations go far enough. He said Gogama community members want answers from CN and the federal government as to why the derailments are happening. He is also concerned about not being informed by CN what’s in the rail cars passing through his community. “Hey guys, we’ve got to do something about this. You know, these people don’t need to go through this amount of stress. I can handle other kinds of stress, but this is getting a little too close to home…Well it certainly brings it home because of the Lac-Megantic tragedy. You got one that’s two kilometres away and you see the flames, you see the smoke, yeah, holy mackeral, is the next one right in Gogama?”, said Talbot. Following the 2 CN derailments near Gogama in 3 weeks, federal Transport Minister Lisa Raitt says she has made her concerns known to Canadian National Railway. She has asked CN about their inspections and activities in the area. “It does make you think and it makes you wonder…operationally, that they have to make sure what they’re doing is exactly correct…That’s a lot of cars and that’s too many derailments, in my opinion, in a short period of time”, said Raitt. 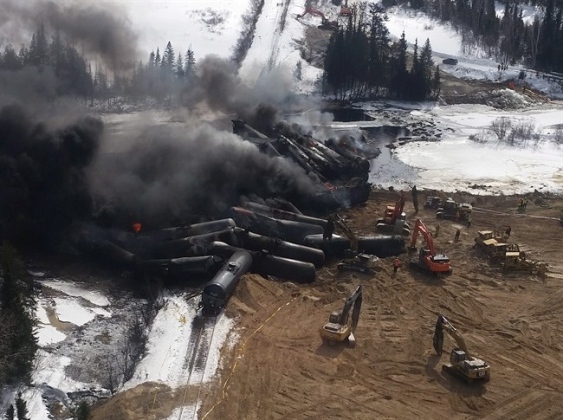 Canadian National Railways’ most recent derailments, spills and fires have certainly heightened the debate about rail safety in Canada. Read CN Railway Derailments, Other Accidents and Incidents for more information about CN derailments in Canada and the United States. See this link for more information on the hazards of shipping oil by rail. ~ by railroaded on March 10, 2015.